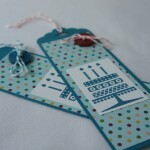 And I love how simple this card is! Its really just layers on layers and doesn’t need any punches, embossing folders or any special tools, just scissors (or if you’re averse to cutting in straight lines, a Stampin’ Trimmer could be your best buddy!). 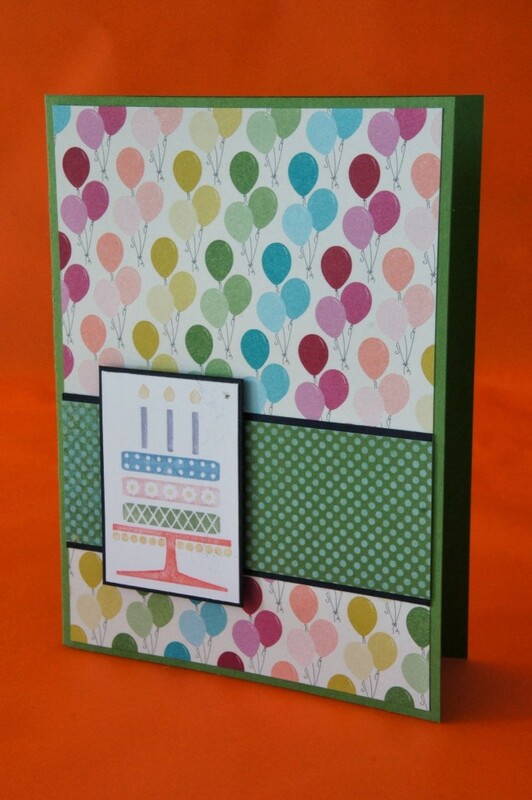 The pretty balloon designer series paper is from the Birthday Basics set and the contrasting gumball green designer series paper is from the Epic Day This and That set. The main card base is also gumball green and there’s a little bit of basic black cardstock to create frames around some of the layers. 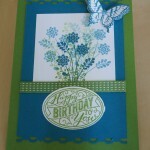 The birthday cake image is from my well used Embellished Events stamp set. 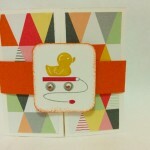 Although simple, this card does showcase the technique of colouring in stamps using the Stampin’ Write Markers. This technique really is as simple as colouring in different parts of the rubber image in your chosen colour and stamping. There’s no need to rush the colouring in, as once coloured, the ink can be revived by breathing on the stamp (known as “huffing”) before stamping. The colours I’ve used for my cake are So Saffron, Wisteria Wonder, Marina Mist, Blushing Bride, Wild Wasabi and Calypso Coral which are all from the subtles collection. Of course you could use any colours you liked and at my card class there were several lovely designs done in all sorts of colours and even just alternating two colours as you go down the came looked very striking. I stuck the cake layer on with Stampin’ Dimensionals to give it some lift off the card and that was it, simple. Off you go now, get creating! One Response to "Birthday Balloons"